The term gothic landscape refers to a genre of depicting nature or the built environment in a way that reveals its dark, sinister, or haunting qualities. The gothic landscape in art runs parallel to the literary genre of American Gothic fiction popularized in the nineteenth century by authors such as Edgar Allen Poe and Charles Brockden Brown. American Gothic fiction often contains elements of the macabre, supernatural, and mysterious, and Gothic stories often describe situations in which humans encounter nature in a way that makes them aware of their own mortality. American Gothic landscapes pictorially represent the dark and haunting elements of these fiction stories and often present nature in its most frightening form. 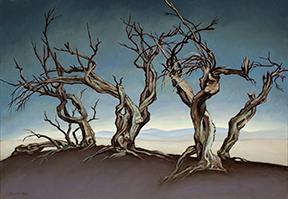 While some Gothic landscapes are obvious illustrations of horror, others display more subtle characteristics such as decaying flora, crumbling buildings, or simply a dark color palette that give the viewer an uneasy feeling. This exhibit showcases the Art Museum’s collection of landscapes that exemplify a Gothic style or mood. 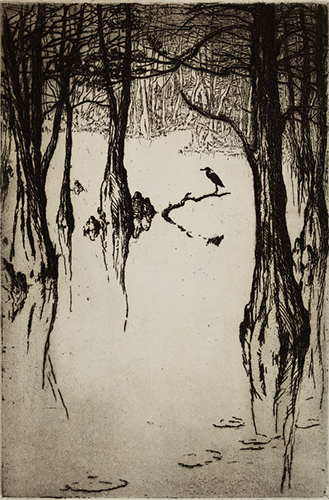 While many often think of the swamps and bayous of the American South as being particularly Gothic in nature, this exhibit attempts to convey the variety of American places that can and have been depicted in a Gothic style including several examples from the American West.